Finance ministers and central bankers from top economies are battling to find common ground in the face of Trump's "Buy American" drive. 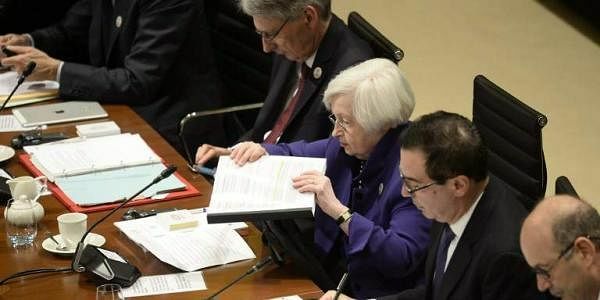 BADEN-BADEN: Finance ministers and central bankers from top economies are battling Saturday to find common ground on world trade in the face of US President Donald Trump's "Buy American" drive. Ministers from G20 nations have gathered in the picturesque western German spa town of Baden-Baden since Friday for a meeting clouded by fears of growing protectionism fuelled by Trump's stance. Trump, whose tough "America First" talk helped win him the presidency, has withdrawn the US from a trans-Pacific free trade pact and attacked export giants China and Germany. That stance has grated with Washington's partners, who are trying to persuade US Treasury Secretary Steven Mnuchin to hold fast to a long-standing G20 anti-protectionism commitment. But talks have so far failed to produce a breakthrough for consensus on the issue, and the clock is ticking down to the close of the two-day session when a final statement is due to be published. The separate issue of climate change has also become a sticking point, participants said, noting that the US delegation is reticent to sign up to previous pledges to help fund mitigation programmes. French Finance Minister Michel Sapin said if no agreement could be found on both issues, that could be reflected in Friday's final statement. "Our heads of states are meeting in a few weeks. On subjects that are so important, it's not up to the finance ministers to block or to walk back on the issue, there will not be any backsliding on such fundamental issues," he said. Carried to power on the back of a political storm over deindustrialisation in vast areas of the US, Trump vowed in his inauguration speech to "follow two simple rules: buy American and hire American." Organisation for Economic Cooperation and Development (OECD) head Angel Gurria pointed to similar developments elsewhere, in a "backlash against globalisation" which is seeing growth and economic reforms stutter as populations grumble over inequality. Governments should spread the proceeds of economic growth more widely to contain popular anger that risks further roiling the global economy, the rich nations' club urged in a report presented at Friday's G20 gathering. Trump himself insisted at a tense Washington press conference Friday following his first meeting with German Chancellor Angela Merkel that "I'm a free trader but also a fair trader". He also rejected a description of his policies as "isolationist." But the differences between the two were laid bare as Merkel took the opportunity to push back against Trump's calls for individual trade deals with European countries, suggesting instead that the White House "come back to the table and talk" about a stalled US-European Union pact. Germany has been found itself in the crosshairs of US criticism over its massive trade surplus. Trump has also threatened to slap heavy taxes of up to 35 percent on German automaker BMW if it persisted in building a factory in Mexico. On Thursday, following talks with German Finance Minister Wolfgang Schaeuble, Mnuchin said Washington had no desire to fight "trade wars" with other economic powers. But there is a "desire to deal with where there is an imbalance in certain trade relations. We have a means to address that," Mnuchin said, referring to White House advisors' belief that Chinese and German goods are priced too low in the US because their currencies are too weak against the dollar. While trade has been the weightiest bone of contention at the finance ministers' talks, climate change -- which Trump once claimed was a Chinese hoax -- puts the US equally at odds with its longtime partners. A source close to the talks said US negotiators appear to be unable to commit to climate change-related wording in the final communique due to an absence of mandate from Washington. On Thursday, Trump proposed to take the axe to environmental financing, slashing funds in his first national budget proposal for the Environmental Protection Agency (EPA) by a third, as well as eliminate contributions linked to the UN climate change programmes. But EU economy commissioner Pierre Moscovici noted that "we are not here to talk about the domestic policy of this or that member state, we are here to talk about what we can do together". "It is essential that we affirm that common principles here so that the process can continue to advance," he told AFP.